My plan tonight was to go out and order a large pepperoni, stuffed crust pizza to celebrate the end of the Genghis Grill Health Kwest Competition. When I hopped on the scale this morning and it told me I was 36 pounds lighter, I changed my mind!! 27 of those pounds were lost during the competition and the rest was done on my own! I feel so good! You're not only looking at weight loss, but you're looking at lowered blood pressure, lower cholesterol and lowered blood sugar. I was on blood pressure meds for 5 years. I researched and weened myself off. In August, 2012, my doctor told me that I was pretty much a type 2 diabetic, but it wasn't bad enough to where I needed medication. It was still reversible. I prayed, completely changed my diet and added in exercise. This journey isn't about being skinny, I really want to be healthy for the rest of my life! 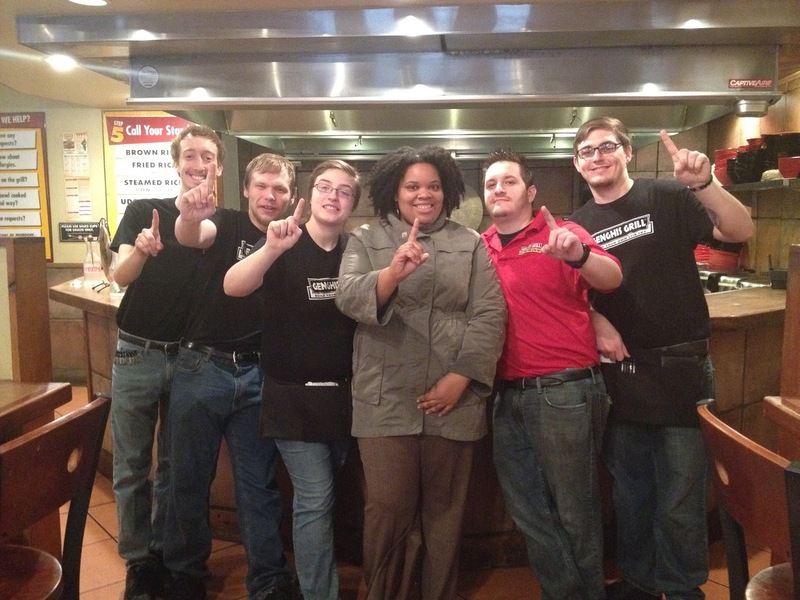 I thank God for the experience I've had with the Genghis Grill Health Kwest competition. It has literally changed my life! The staff exceeded my expectations. Everyone was loving and really took the time out to be supportive during the competition. I'll forever be grateful! Plus, I won the commercial mini prize! Yay! Shout out to Ed, Ted, Ross, Kurtis with a K, Forrest, Cheyenne, Sydney, Alex, Claudia, Marta, Loren, Britton, Kelsey, Jennifer, Fernando, Serano, Angel and the rest of the staff!! I love you dearly!! April Fools Day with the staff!!! Ross, Kurtis and Cheyenne. My loves!! Wow...I've changed a lot!! God is grand! What's next?? Well, you have to stay tuned! Until then, I'll continue to eat healthy, workout, blog/vlog and keep up this healthy lifestyle. My goal is to be 100 pounds down by my 31st birthday! 64 more pounds to go!!! !